The recipe I bring today is a classic one. It’s the well-known French meringue; in this occasion, piped and slowly baked in order to make meringue cookies, also known as meringue kisses. 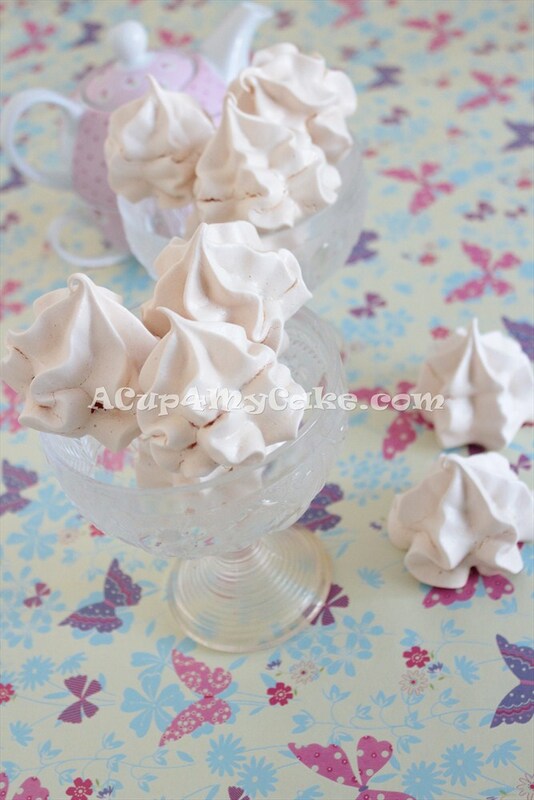 These meringue cookies are really light, crisp, dry and melt in one’s mouth. They’re delightful! Give them a try. • The egg whites have to be at room temperature, at least 1 hour outside the fridge before using (better overnight). Otherwise, they won’t whip up properly. • There should be no traces of egg yolk in the egg whites. Otherwise, they won’t whip up properly. • Use clean, dry and grease-free mixing bowl and tools. Otherwise, egg whites won’t whip up properly. You can spread half lemon through the bowl in order to remove any trace of grease, if any. Dry with a kitchen towel. • If you use a stand mixer, you need to use the whisk attachment in order to introduce air into the batter while whipping up the egg whites. No other attachment should be used for this purpose. • Independently of the amount of meringue we want to make, we always have to use exactly double the weight of sugar to egg whites. • One egg white weighs around 30 grs. • It’s useful to add a pinch of salt or cream of tartar to stabilize the egg whites and hold the meringue shape once is whipped. • Add the sugar gradually when the egg whites start whipping (soft peaks), never before. Otherwise, it’ll be more difficult to whip the meringue and it’ll take longer. • Don’t overbeat the batter! Otherwise we’ll get a dry, dull and grainy meringue, with little air. • Meringue cookies have to be slowly baked (low temperature, for a long time) and cooled inside the oven in order to remove all the humidity from the meringue, as we want to get dry and crunchy cookies. • Preservation: They keep crisp for many days in an airtight container placed in a dark and dry place, since they’re really delicate and easily affected by humidity. Due to this, never keep them inside the fridge as they can become sticky because of dampness. 1) Foamy: Runny consistency plenty of large air bubbles (it looks like liquid soap combined with water). There are no peaks when lifting the whisk from the foam. 2) Soft peaks: Nice, beautiful and consistent foam. 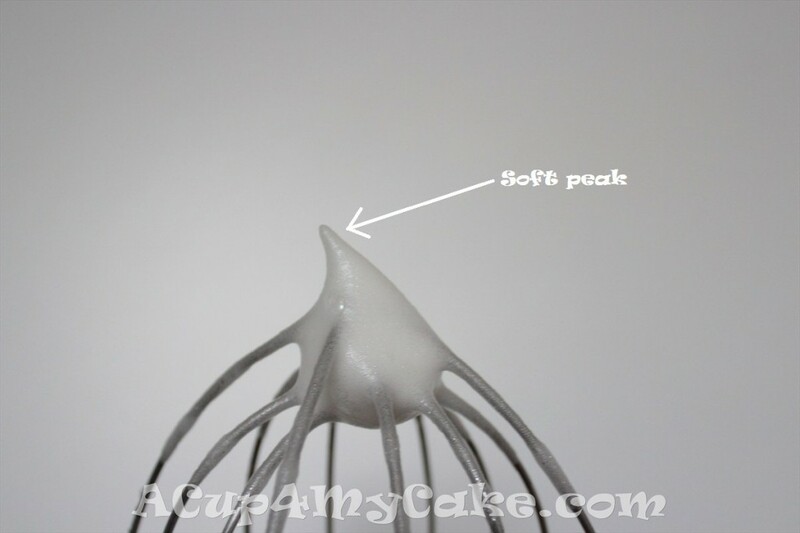 There are soft peaks when lifting the whisk from the batter. 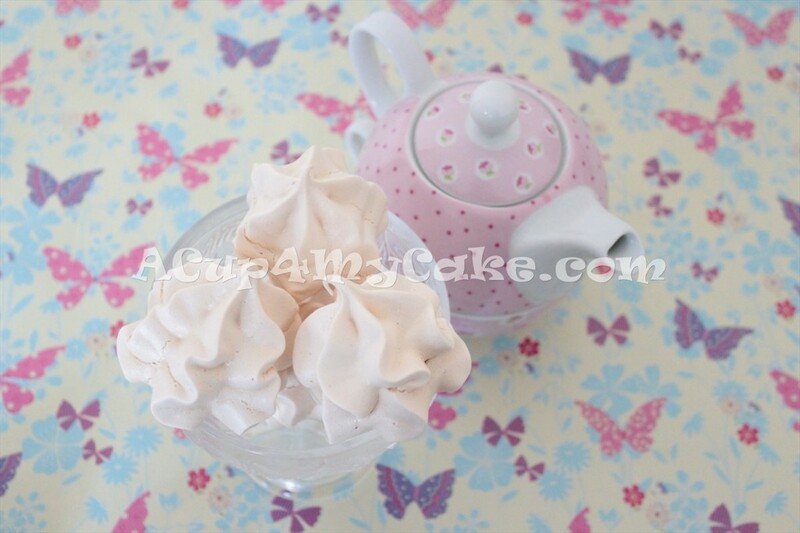 3) Firm peaks: The meringue starts to be creamy and glossy, but not as thick as it should be. There are firm peaks when lifting the whisk from the batter, that is, peaks that hold but the tips fold back on themselves. 4) Stiff peaks: This is the stage we have to get. Our meringue is ready! It reaches its maximum volume, and it’s really glossy and thick. 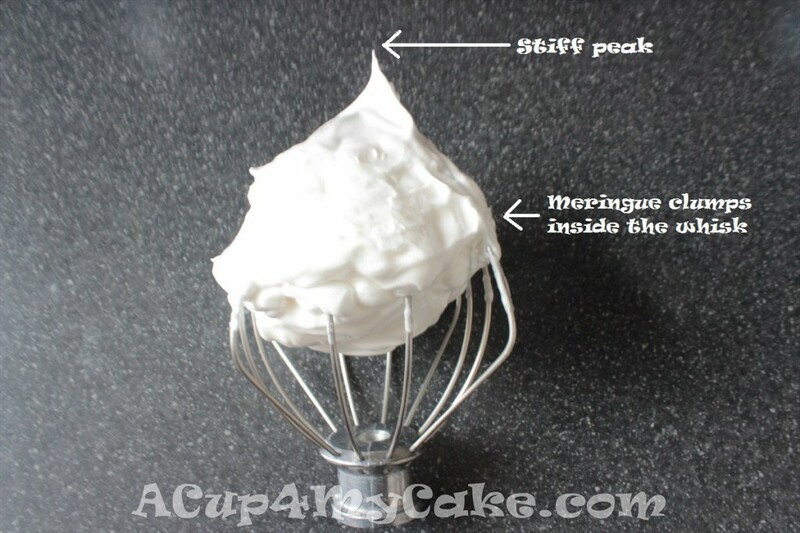 There are stiff peaks when lifting the whisk from the batter, that is, peaks that hold their shape with upright tips. The meringue doesn’t slide off when turning the bowl upside down. 5) Overbeaten: We get a dry, dull (no longer glossy) and grainy batter. Lot of air lost. And now let’s go with the recipe! 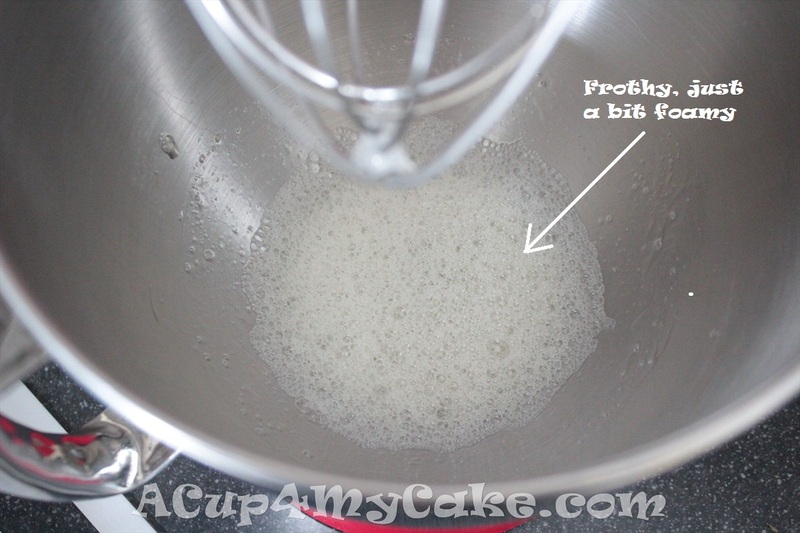 1) Mix the EGG WHITES at medium speed until frothy (foamy stage, lots of air bubbles on the surface). 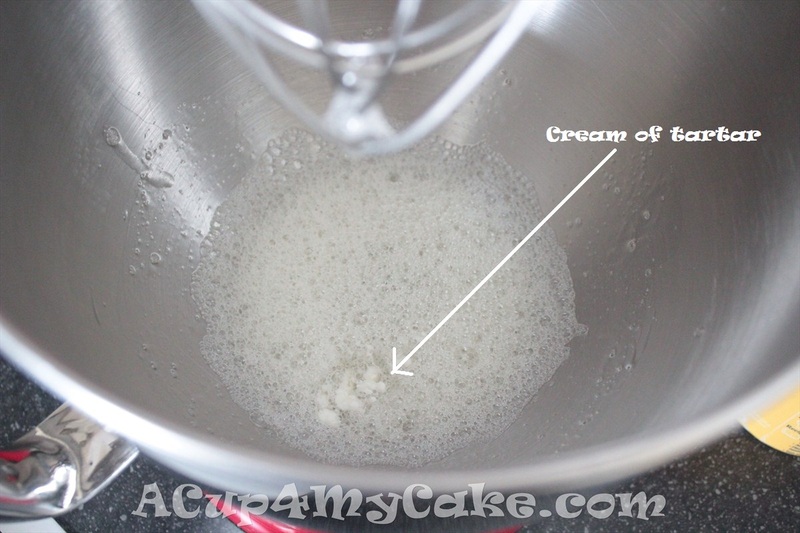 2) At this stage (foamy), without stopping your mixer, add the PINCH OF SALT or CREAM OF TARTAR. 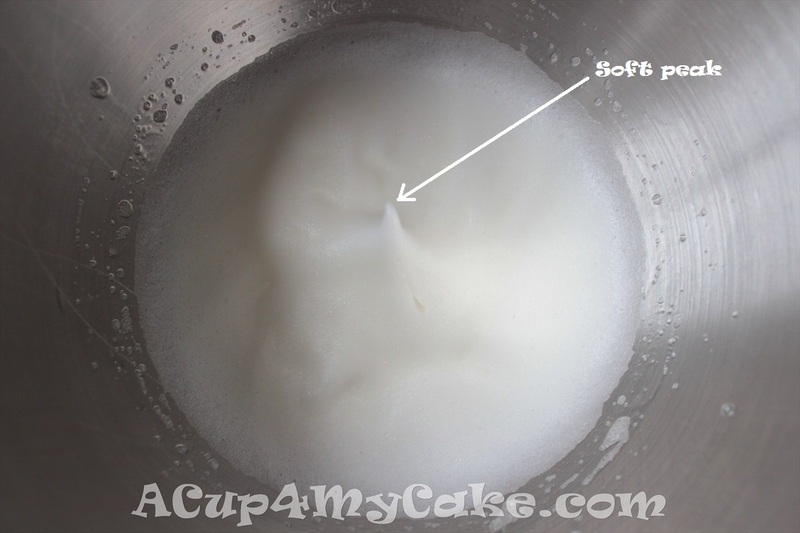 3) Keep mixing at medium speed until get a nice and consistent foam (soft peaks stage). 4) At this stage (soft peaks), without stopping your mixer, increase to high speed and gradually add the SUGAR in 3 additions. 5) After adding all the sugar, add the VANILLA EXTRACT. 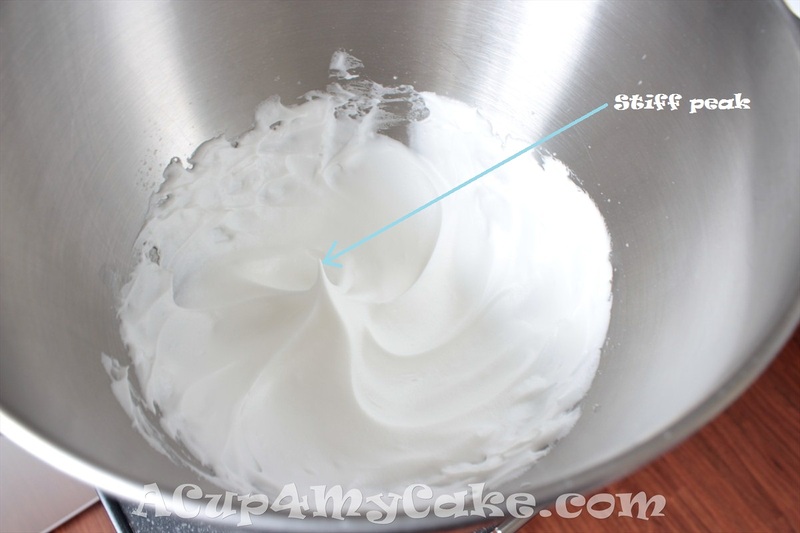 6) Keep mixing at high speed until getting a really glossy and thick meringue (stiff peaks stage). Our meringue will be ready when becomes glossy, clumps inside the whisk attachment, just forms stiff peaks when lifting the whisk and doesn’t slide off when turning the bowl upside down because is thick enough. Be careful not to overbeat. 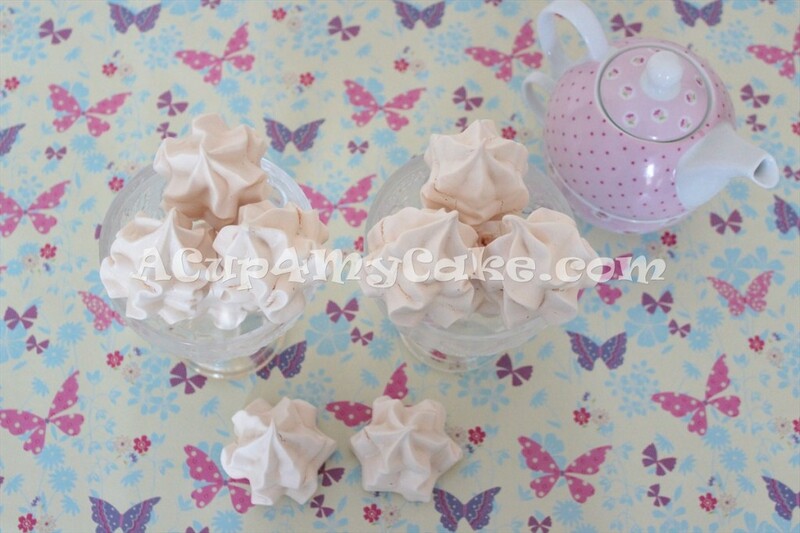 7) Attach a star nozzle (#1M, #2D…) to the piping bag and fill it with the meringue by scooping carefully with a rubber spatula. Tighten the piping bag on top after filling it to avoid the meringue to come out. 8) Pipe your meringue cookies (rosettes, swirls… ) on a parchment lined baking sheet. Leave a 5 cm gap between each meringue. 9) Bake the meringue cookies slowly in a preheated oven at 120º for about 1 hour. Actually, we don’t have to cook the meringue itself, we have to dry it, evaporate all its water, remove all the humidity, in order to make it crisp and dry. To make sure they’re ready after the baking process, tap them gently: they have to be hard and sound hollow. 10) Leave them to cool completely inside the oven (preferably overnight). It’ll help to remove the remaining humidity. 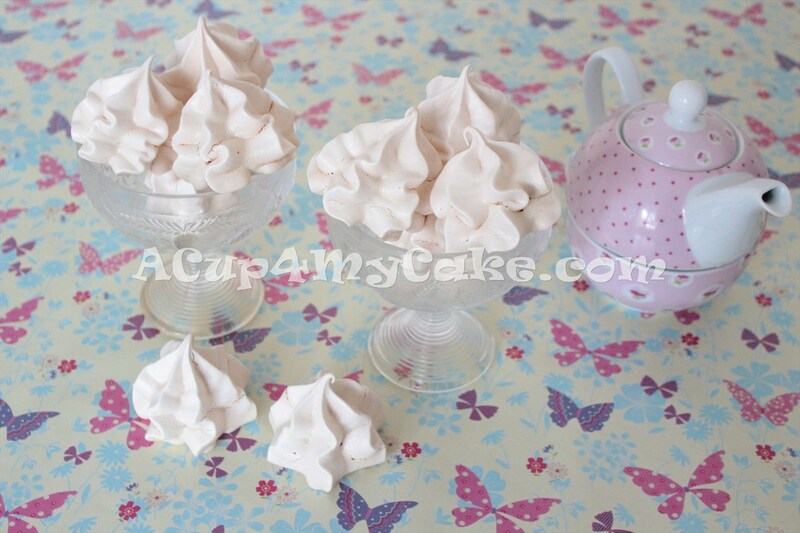 Meringue cookies texture is amazing, you must try them: crisp… but they’ll melt in your mouth! 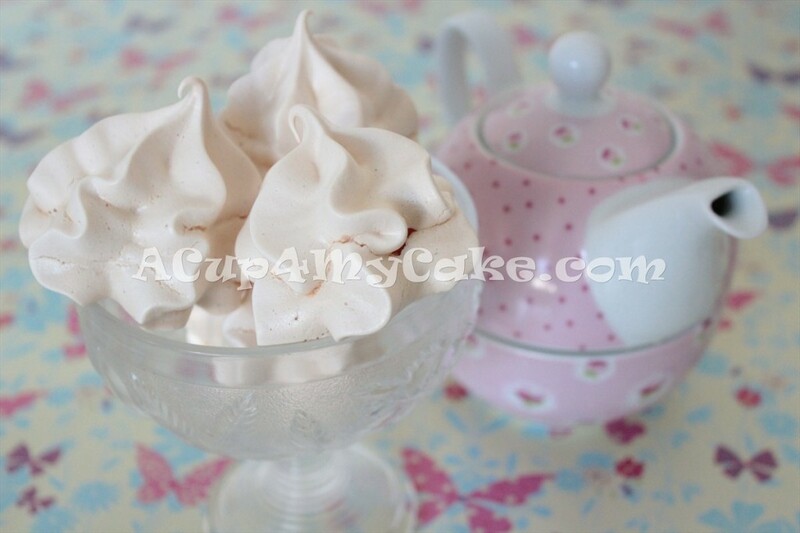 This entry was posted in Cookies, Gluten-Free, Meringue, Recipes, Tutorials. You can colour them once you’re whipped the meringue. Hi there, thanks for your comment. I mean 120C. Regards. Hi. I want to put my meringue cookies on top of my cake but I have to keep it refrigerated because if the Bavarian cream that I have it filled with. Will my cookies be ok for a few hours on top of the cake in the fridge? Hi Claire, it should be OK. But bring the cake back to room temperature before eating it for best results. Regards.